Jason McConnell and I were finally granted a two day weekend free from the roof on BC Place and, wanting to climb something in the mountains but not wanting to drive or hike too far, we decided to check out the Pup Buttress route on Harvey’s Pup above Lion’s Bay. Jason scrambling up the ramp that cuts across Mt. Harvey's North Face. I'd been here on four occasions in winter so it was nice to see what it looks like without any snow. We approached the route without particularly high expectations and we were both pleasantly surprised by the quality of the climbing. The whole experience actually reminded me of the Steck-Salathe in Yosemite: a scrambly approach ramp leads to steep chimney climbing and an eventual descent down an unpleasant gulley. Admittedly, the climbing on Harvey’s Pup is a little less technically difficult and sustained than its Yosemite counterpart, but the low elevation coastal nature of the route ensures that it’s not completely devoid of adventure. 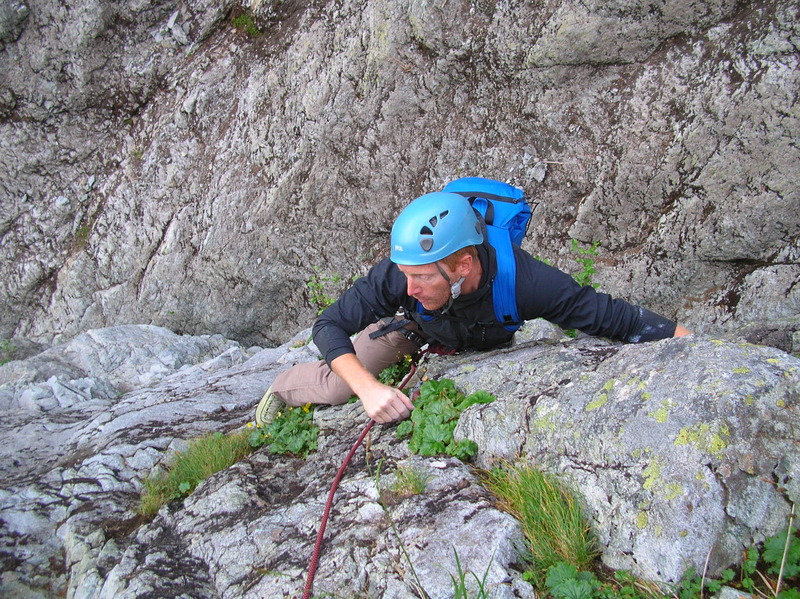 Jason climbing the "left-leaning, left-facing corner" pitch. I'll admit that the route might not be quite as classic as the Steck-Salathe. • The logical start to the route is only slightly downhill from the “gut”. The goal is to traverse under a low roof to gain the base of a slender chimney with a small tree at it’s base that makes a good landmark. I didn’t notice the cairn or fixed pin described in the guidebook. Jason following the first pitch. From here, the route-finding gets considerably easier. 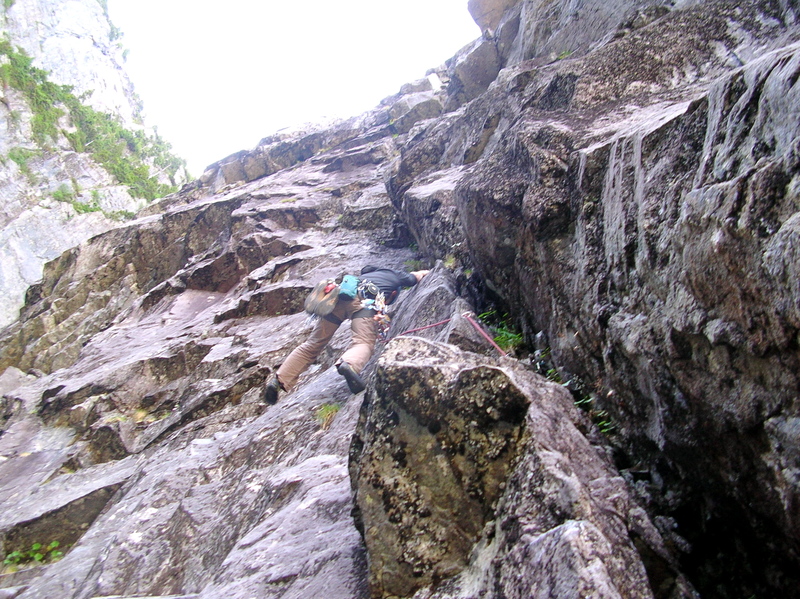 • Linking the first two pitches on the “dark headwall” would be nice as neither pitch is particularly long and there aren’t really any great stances from which to belay. • A #4 camalot-sized piece protects the crux moves rather nicely. • The descent only requires a single rope. The descent gulley is not particularly enjoyable. 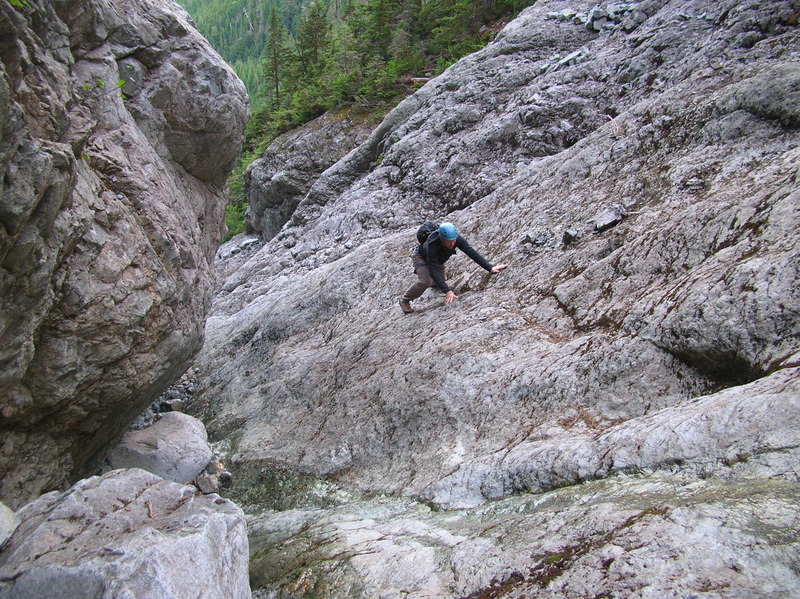 Climbing directly out from the notch also looks quite unpleasant, but it might be worth investigating a traversing line towards the hiking trail beginning just a short ways down the gulley. Nice work. A fun route. Did you find the family of Mountain Goats on your descent? Unfortunately we didn’t see any mountain goats; the only other “wildlife” were the swarms of mosquitos. Good to hear that you enjoyed the route too. I did this rig with Andy Cairns way back in the 90s and you’re correct, the route out of the notch to the summit is not that great either.